The Pygmy Falcon, a tiny (just 50-70 grams), dumpy, shrike-like raptor makes up in character what it lacks in size. Courtship is a very noisy affair accompanied by much head-bobbing and tail wagging. You can see this display for yourself in enclosure 19 when you visit the Sanctuary! They occur in two distinct populations directly related to sociable weavers in the south-western Africa and the White-headed Buffalo weaver in east Africa. This is because the Pygmies borrow a compartment of the weavers’ nest structure in which to roost and breed. Down south both pygmy falcons and sociable weavers are found in the dry, arid regions of Namibia, Northern Cape and western Free-state. The weavers eat insects and seeds and live and breed colonially, with up to 500 birds residing in a single nest. These nest structures are made entirely of dry grass stems and each pair builds their own nest chamber in the superstructure. The nests of the sociable weaver are the largest single structures built by any bird in the world and can attain a width of 7m and a height of 4m and weigh up to a ton, sometimes breaking the supporting tree. These giant grassy communes are often built in Acacia trees or even on windmills or telephone poles and can be active for as long as 100 years. The nests regulate the birds’ environmental temperature and keep air cool in summer and warm in the freezing nights of winter. The weavers breed opportunistically after rain falls and their young are heavily predated on by cobras and boomslangs, but rarely by the Pygmies themselves. The falcons prefer large insects, lizards and sometimes small mammals and birds. Other raptors, like Secretary Birds and Giant Eagle Owls, also nest on top of deserted weaver nest-structures. 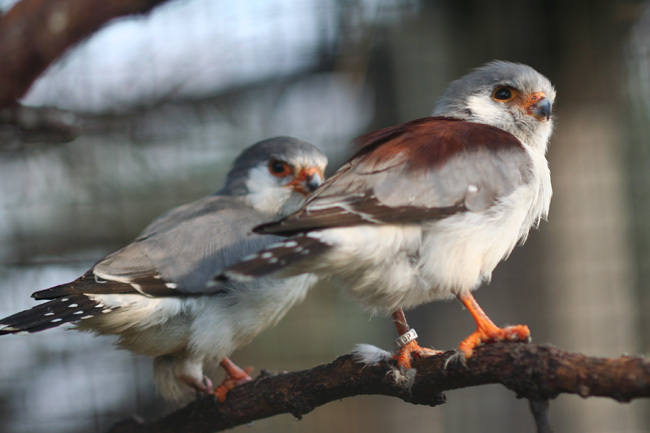 The primary pygmy falcons at the Sanctuary are called Peewee and LuLu. The female Lulu, has the brown mantle. In early springtime three eggs are normally laid in the nest boxes in the enclosures. The whole family sleeps in there at night and it certainly must be quite a squeeze.